Welcome to Study Campus, a premier learning institute in Mumbai. If you are planning to become a part of the Indian civil services department, then you must have started searching for an elite coaching institute that prepares students for the IAS examination. 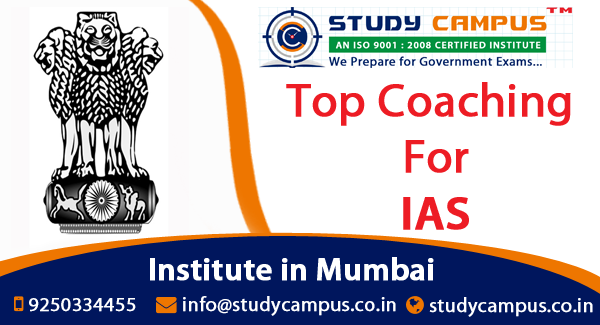 We take great pride in introducing our institute as the best coaching classes for IAS in Mumbai where knowledge meets excellence. We rank among the top 5 renowned institutes in Mumbai that prepare students for the various competitive examinations. Our highly experienced and knowledgeable faculty members have expertise in preparing students for UPSC examinations, so you can rest assured of your preparation levels with us. Each of our team members is dedicated to going that extra mile to help our students in every possible manner and prepare them to come out successful from even the toughest selection processes. Clearing the IAS examination is very difficult, as not only the number of applicants’ is very high but the difficulty level of the examination is also very high. You will require the guidance of renowned IAS coaching classes in Mumbai that knows the correct approach of starting preparation for competitive examinations. Our qualitative and unique teaching methods are designed to help students to better grasp the syllabus and prepare according to the latest exam pattern. Once you clear both the preliminary and the main examinations along with the interview, you will be left open to a host of opportunities. Our result-oriented preparation is backed up by a series of evaluation tests that ensure each student is well-prepared to appear for the examination. We hold a record of delivering the highest student success rate compared to other similar institutes and this is one of the many reasons why we receive numerous inquiries for our offered courses from different areas including Borivali, Thane, Andheri, and many more. You can visit our institute for getting a detailed insight of our offered courses.